I need a new bath mat. The one I have is stained and yucky. Never looks clean anymore. Being a cheap and thrifty up-cycler, I decided to see what I could make. First attempt. Ta-da! A jean rag rug from our old cast-offs. Okay, not as tight as I want it, and I think the dark part needs to be darker, so I’m going to unravel it and start over, tighter, and twisting the dark fabric so the dark indigo color is showing more. Do you want to do the experiment too? 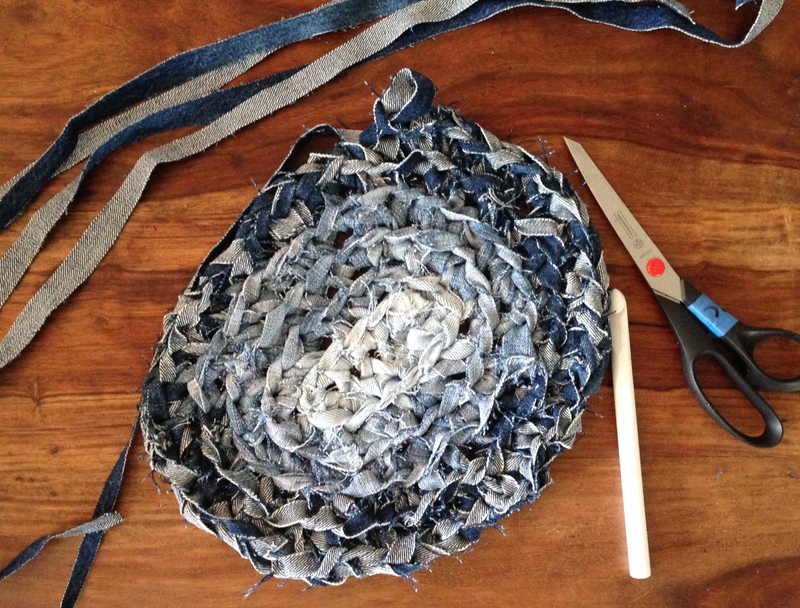 I’m using an 11.5 mm P crochet hook and 1/2 inch strips of cut up old jeans. 3. Turn and start circle crocheting around the little strip you’ve made. To crochet a circle you sc into the first stitch, dc (double crochet) into the next, sc, dc, sc…on and on. The every-other stitch increase keeps the oval flat. I’m thinking I might switch to a square rug, what do you think? This entry was posted in crafting and tagged blogging201, crafting, crochet, denim, housekeeping, jeans, recycling, up-cycling by Project Easier. Bookmark the permalink. Uh-oh, I hope my dog doesn’t eat it. lol! My dog has eaten every small rug I’ve purchased for the bathroom. Maybe it’s time to try this — unless he likes denim too. I think he prefers short shag though. Who Was the Poet Frank Stanford?